This book shows in detail how to build enterprise-level secure, redundant, and highly scalable services from scratch on top of the open source Linux operating system, suitable for small companies as well as big universities. The core architecture presented is based on Kerberos, LDAP, AFS, and Samba. It is shown how to integrate web, message related, data base and other services with this backbone. This architecture provides a Single-Sign-On solution for different client platforms and can also be employed for clustering. Although it is implemented with Debian GNU/Linux, the content can be applied to other UNIX flavors. I think the title of the book does not do the book justice. 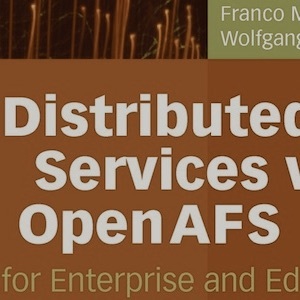 The book covers more than OpenAFS, but covers a large laundry list of services revolving in part around Kerberos. It touches on SAMBA, single-sign-on solutions with LDAP and Kerberos, PKI (OpenSSL) as well as other integration with current technologies. Most books covering technologies on Linux/UNIX are frankly obsolete before they are published, leaving you to pull together bountiful resources online and offline, combined with google searches. This book pulls together a lot of these services, has explanations for them, and gives arms you with practical knowledge and examples on how to integrate these solutions. The alternative would be a book shelf of O'Reilly and other books, where most would be obsoleted anyhow. And this alternative would be limited, as you would seldom gleam how to integrate desperate technologies together. For UNIX/Linux or even MacOS X system administrators, system engineers, or the technically curious (hobbyist), this book is a most have.